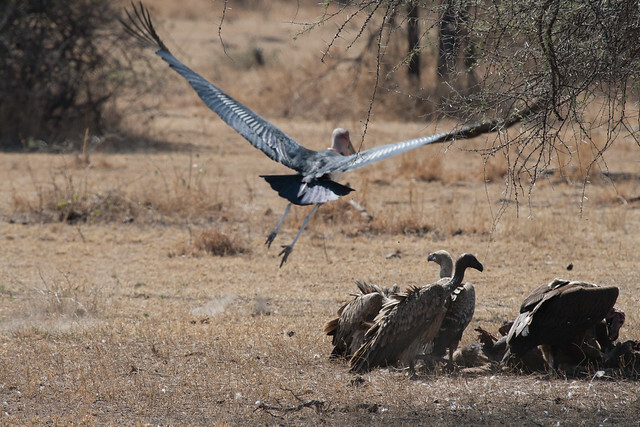 tanzania tuesday: attack of the birds! Studies of this latter strategy have helped reconstruct the possible feeding mechanisms employed by the dinosaur-like ‘terror birds’ of five million years ago. Think about that for a minute. Terror birds. Hundred-foot tall terror birds stomping around and smashing tiny mammals with their beaks. Terrifying. 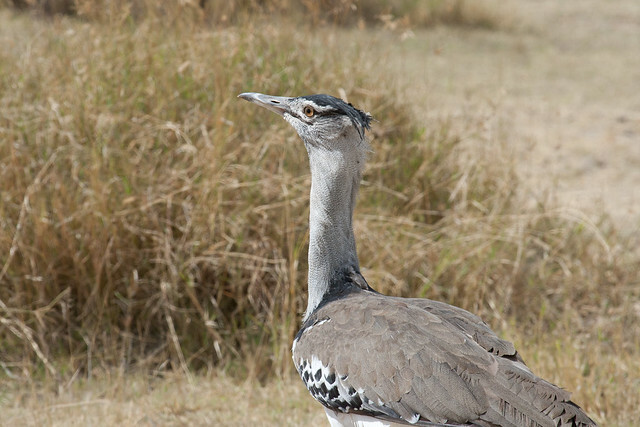 A Kori Bustard. 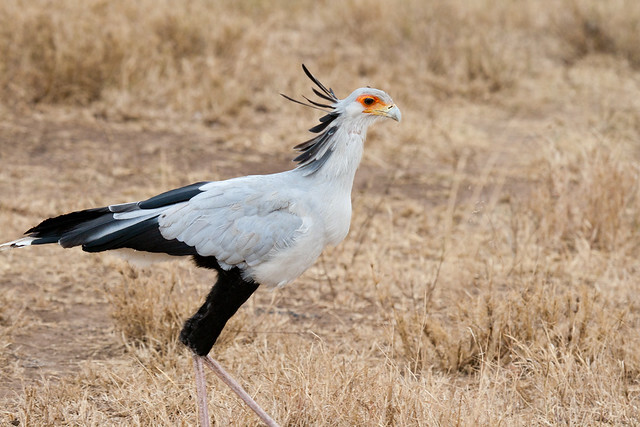 We got these confused with secretary birds, although in retrospect, I’m not sure why as they look quite different. Apparently, another bird (the bee catcher) is supposed to ride on top of this bird, although we never saw that happen. 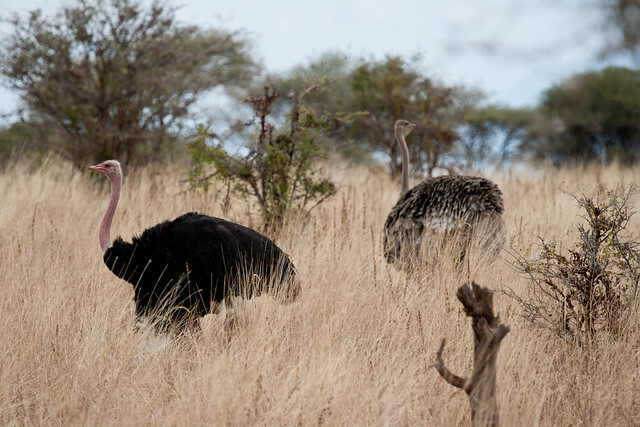 No explanation needed for these ostriches. 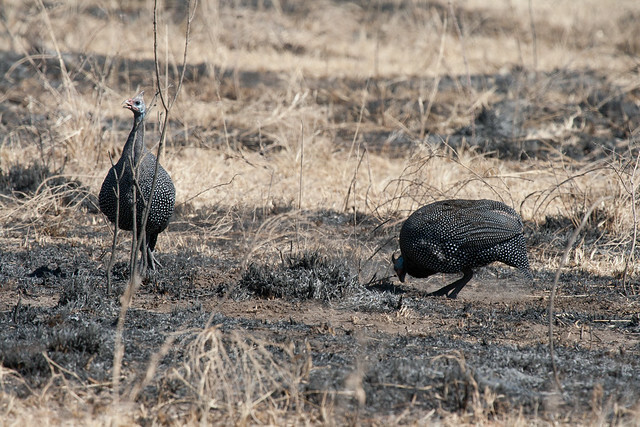 They’re pretty common in the Serengeti, and once we saw a flock of perhaps 10 or 12 just standing around. 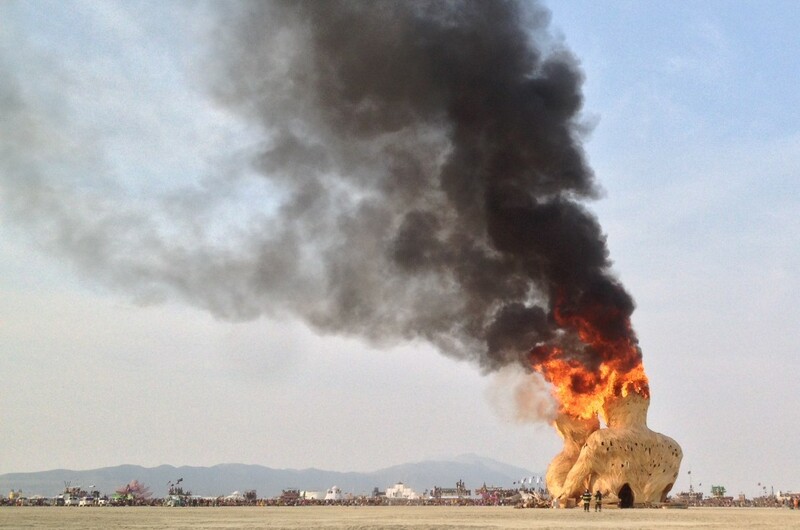 Quite a site. The male has the darker feathers, and the female is a lighter shade of grey. I find it bizarre that they have different colored necks. 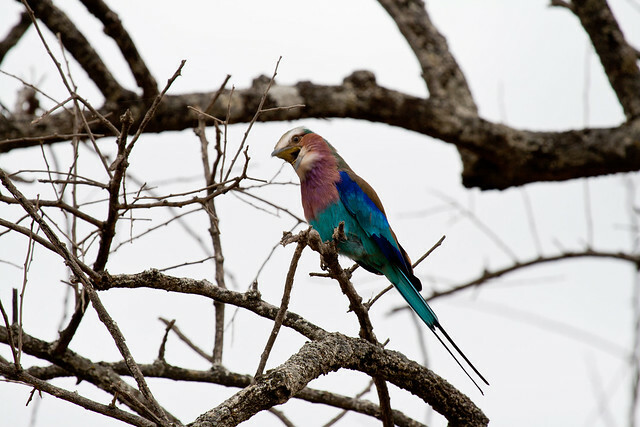 Small birds aren’t easy to identify for a non-birder, but the lilac-breasted roller is colorful and distinct. Other small birds were pretty much impossible to identify, let alone photograph, as they were constantly flying away from us. 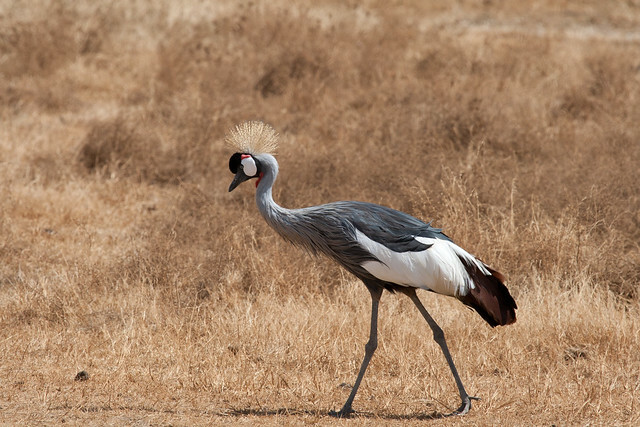 We saw lots of crowned cranes, although in local vernacular, they’re just referred to as crowns. Surprisingly for me, crowns seem to be quite happy in dry environments, not needing wet marshes that we typically associate with cranes here in the States. The helmeted guinea fowls always made me laugh because things are funnier when they’re fat. Buzzzzz. A vulture from the old world. 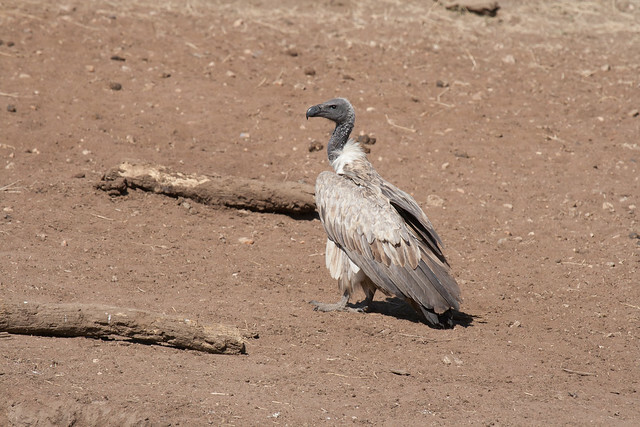 Wikipedia says they’re different from new world vultures because they hunt by sight, rather than smell. 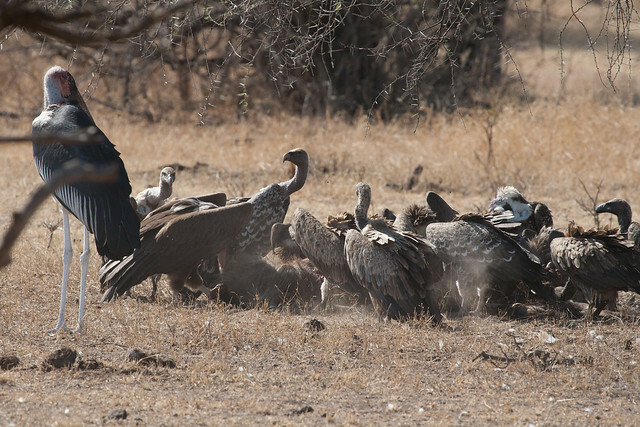 One interesting tidbit I learned was that vultures spend as much time watching each other as they do looking at the ground, and when one bird takes an interest in something on the ground, the other birds join in on the circling. 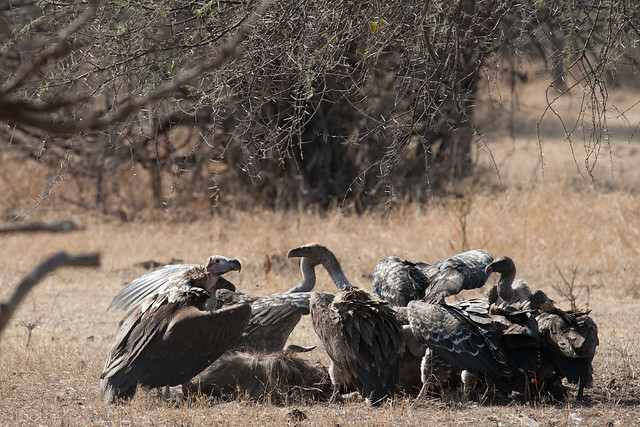 It’s the vulture version of keeping up with the Joneses, and in a hilarious parallel, it’s exactly what the safari trucks do on the ground, watching each other and congregating in hopes of seeing a lion or something. Ooh, the vultures have found a dead wildebeest. Nom! Ruh roh, a marabou stork has arrived. This bird is hideously huge and ugly, and by far my favorite bird I saw the entire trip. 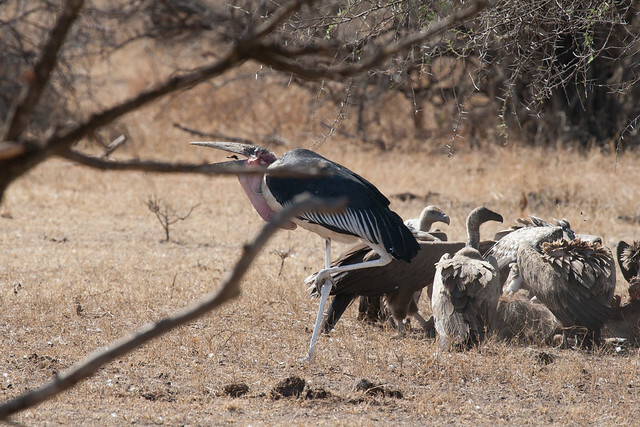 I thought vultures were huge, but look at how the marabou stork dwarfs them. It’s not just foreshortening either. Mr. Marabou gulps rotting wildebeest down his gullet, which expands like a pelican’s. So awesome. Thanks for stopping by for another installment of Tanzania Tuesday!